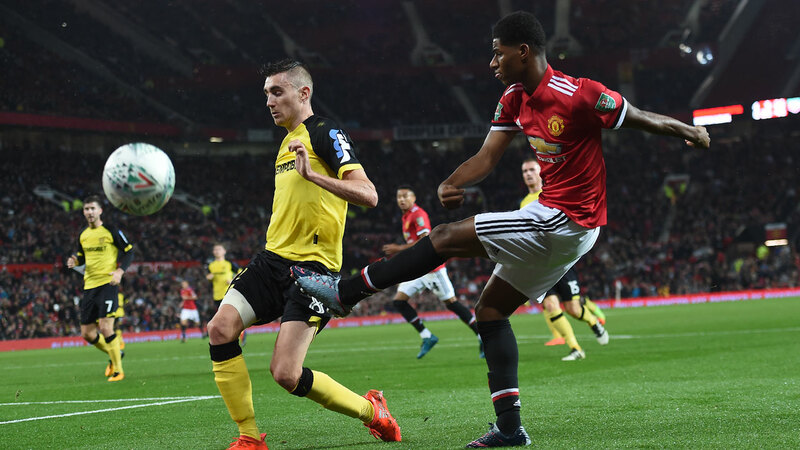 Marcus Rashford fired Manchester United into the League Cup fourth round as the holders crushed Burton 4-1, while Manchester City eased through with a 2-1 win at West Bromwich Albion on Wednesday. Burton, 19th in the Championship, were killed off in the 36th minute when Jesse Lingard’s shot deflected in off Ben Turner. Injury-ravaged United left-back Luke Shaw came on for his first appearance since April before Anthony Martial scored the fourth from Rashford’s pass on the hour. It was from Gundogan’s saved shot that Leroy Sane slotted in City’s third minute opener. But, casting a shadow over City’s progress, Gundogan was forced off with a knock in the second half. Michy Batshuayi’s hat-trick helped Chelsea crush second tier Nottingham Forest 5-1 at Stamford Bridge. Antonio Conte made nine changes from Sunday’s 0-0 draw against Arsenal, with Eden Hazard given his first start of the season after recovering from ankle surgery. Kenedy was starting for the first time since being sent home from Chelsea’s pre-season tour of Asia in July following his offensive social media comments about China. His bid to get back in Conte’s good books got underway when the Brazilian winger put Chelsea ahead in the 13th minute with his first goal since March 2016. Batshuayi’s close-range finish doubled Chelsea’s lead six minutes later before 20-year-old Belgian Charly Musonda smashed in his first Blues goal in the 40th minute. Batshuayi got his second from Hazard’s pass in the 53rd minute and the Belgian striker completed his treble four minutes from full-time, with Forest replying through Tendayi Darikwa in the closing moments. Theo Walcott sealed Arsenal’s 1-0 win over third tier Doncaster at the Emirates Stadium. Dominic Calvert-Lewin blasted Everton to a 3-0 victory over second tier Sunderland at Goodison Park. With eight changes from their defeat at United, Ronald Koeman’s side went ahead in the 38th minute as Calvert-Lewin claimed their first goal since August 24. Calvert-Lewin netted again in the 51st minute and in the 83rd minute Oumar Niasse grabbed his first Everton goal since his 2016 move from Lokomotiv Moscow.